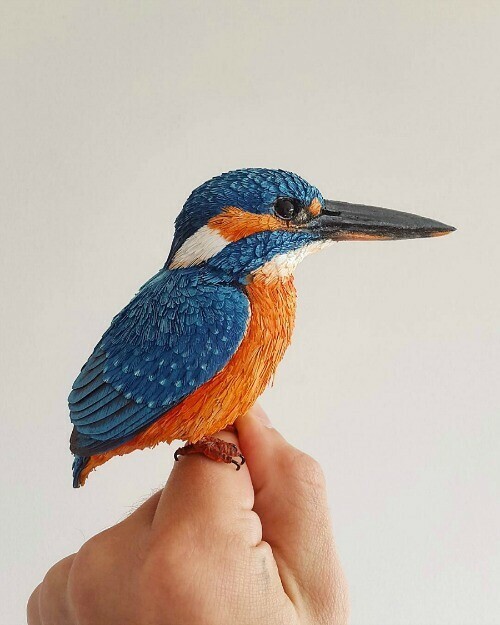 I've been a fan of the beautiful 3D bird sculptures created by London artist Zack Mclaughlin ever since being introduced to them via Colossal about a year ago. 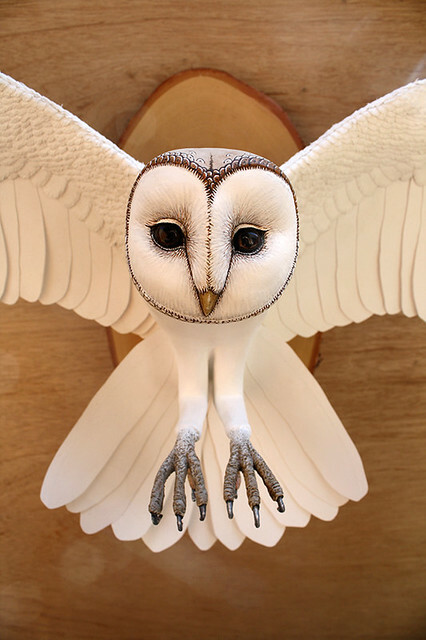 Zack's Paper & Wood Instagram feed is a delight as he often shares in-progress shots and talks about the process of making these highly detailed creatures. 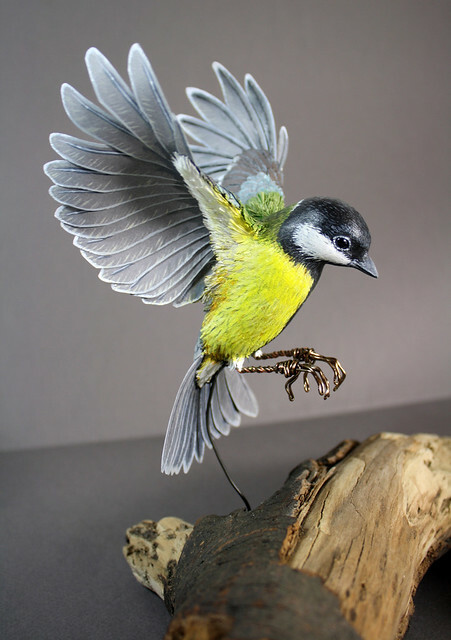 Zack explains that he has long had a fascination with nature and tries to recreate it in many ways, whether it is illustrations for a children's book (he studied Illustration at the University of Westminster), a painting or dimensional model. 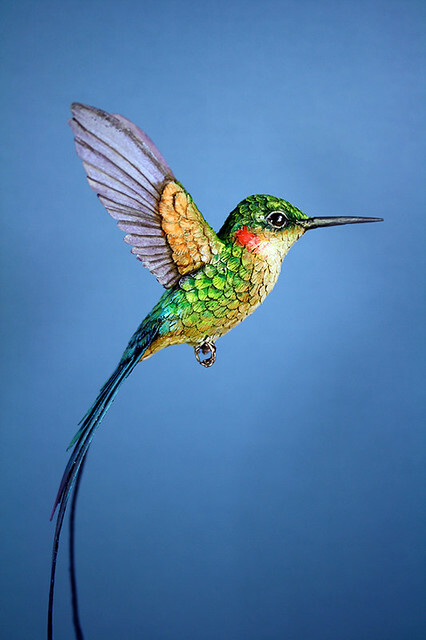 To create a life-size bird sculpture, Zack hand carves the body from bass wood, inserts acrylic eyes - he considers a realistic eye the most crucial detail - and creates eyelids with air-dry clay. Wired tail feathers are glued in place and wing feathers are attached to wire arms that he inserts into the body. Next comes the application of acrylic paint, often with an iridescent sheen. Finally, a coating of matte varnish protects the color and completes the 50-60 hour process. Have a look as Zack adds painted detail to feathers. 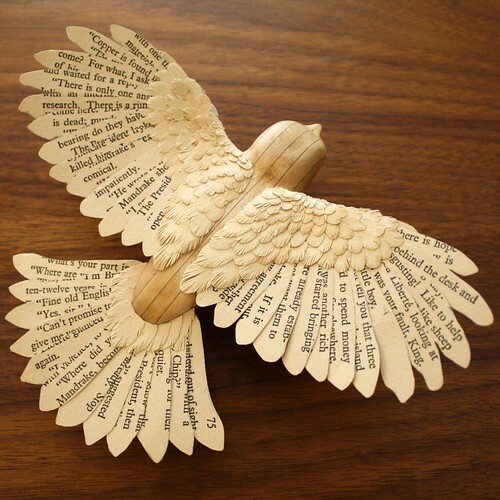 While the Paper & Wood website is relatively new, Zack has been creating sculptures for private buyers, store owners and publishers worldwide for a number of years. 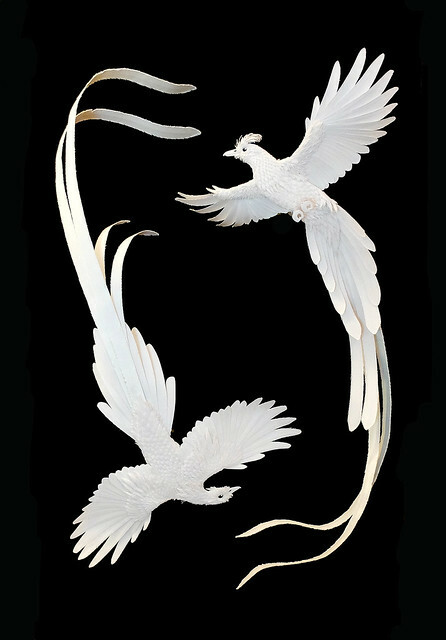 For example, these dramatic all-white beauties were commissioned by Ralph Lauren. 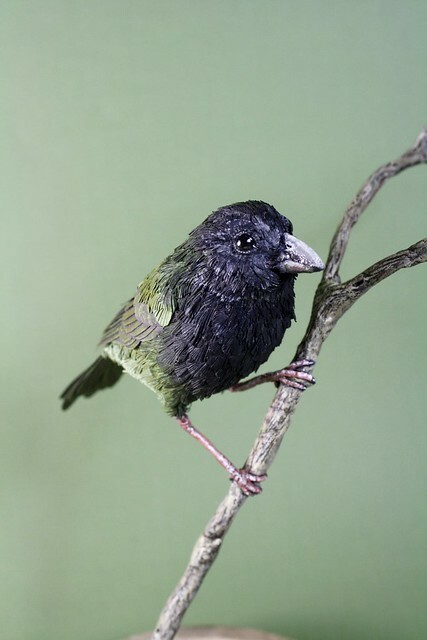 An exciting new aspect of his work is that Zack now offers kits so fellow makers can enjoy building DIY dimensional bird models [edit: aw, his Etsy shop has closed]. 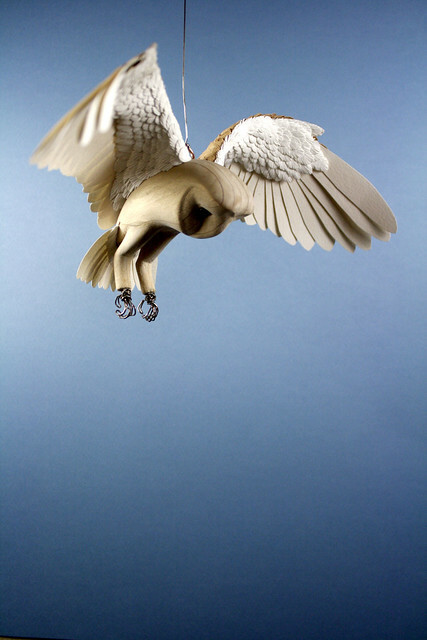 Hummingbird, barn owl and robin kits are available so far, complete with video tutorials. 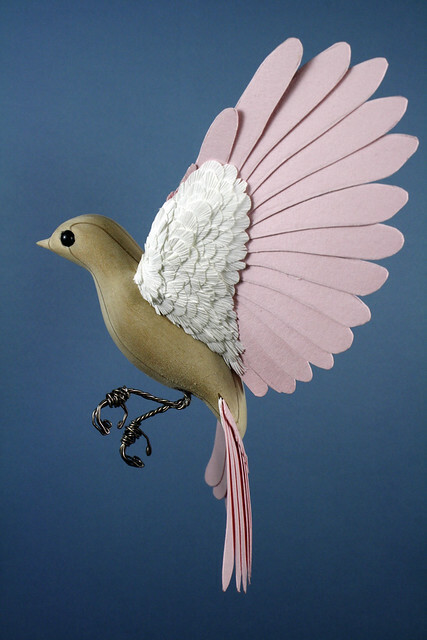 The kits include purchaser's choice of a plastic resin or wood body with wire wing arms and feet already attached, templates/colored paper for creating the feathers and additional essential items - tracing paper, craft wire, glue and brass hanging hoop. 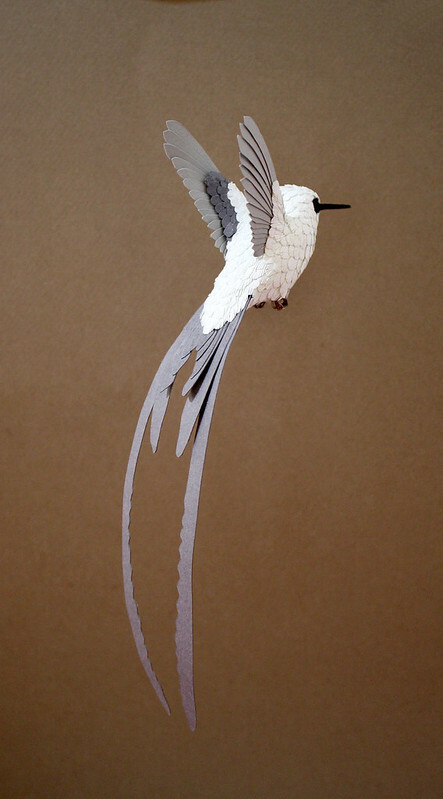 If you are lucky enough to be in London, Zack is leading a wire bird sculpture workshop. Zack Mclaughlin is on Behance, DeviantArt, Instagram, and Twitter. Incredibly lifelike - thanks for bringing this to us, Ann! So glad you enjoyed the post, Anon and Karren!